When you hop on your bike, the first thing on your mind may not be protecting your hands. Even in warm weather, cycling gloves can be helpful, and they’re a must for cold weather riding. The type of cycling gloves, or some would refer to as mitts you need depends on the weather and of course, your personal preferences. 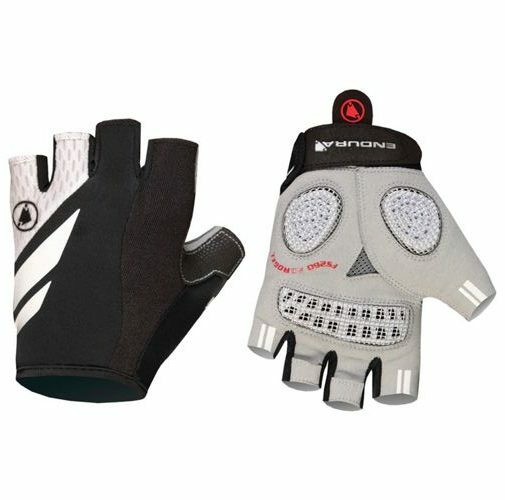 Otherwise, here are my top cycling gloves picks. Look around during your bunch rides during the winter and you’ll soon spot a pair Defeet winter cycling gloves, usually in eye-catching colors. The Defeet Duragloves has been many cyclists’ go-to winter gloves for a few years now. They’re ideal for temperatures between 40F/4C to 60F/16C. You could still go slightly lower if you have good cold tolerance levels. It has the classic and minimalistic look without all the bells and whistles a modern winter cycling glove has. There are no Velcro straps, padding nor liner layers to deal with which would make the gloves cumbersome. Take note that there are 2 variations of the Duragloves with the ET (Electronic Touch) variant being touchscreen friendly at the index fingers. The Gore Bike Wear brand is Gore’s cycling clothing range. With Gore, you rarely will go wrong with their products. This pair of winter cycling gloves is no exception either. If I could only use 4 words to describe it; lightweight, waterproof, windproof yet breathable. It uses the Gore-Tex fabric membrane to achieve its waterproofing and breathable capabilities, making your fingers comfortable especially during wet days or if you’re riding hard. Wind-proofing is achieved through the now mainstream Gore Windstopper fabrics. You can comfortably get down to about 30F/-1C without feeling the numbness or tingling effects from the cold while riding. Castelli is another brand that you seldom can go wrong when it comes to cycling clothing. 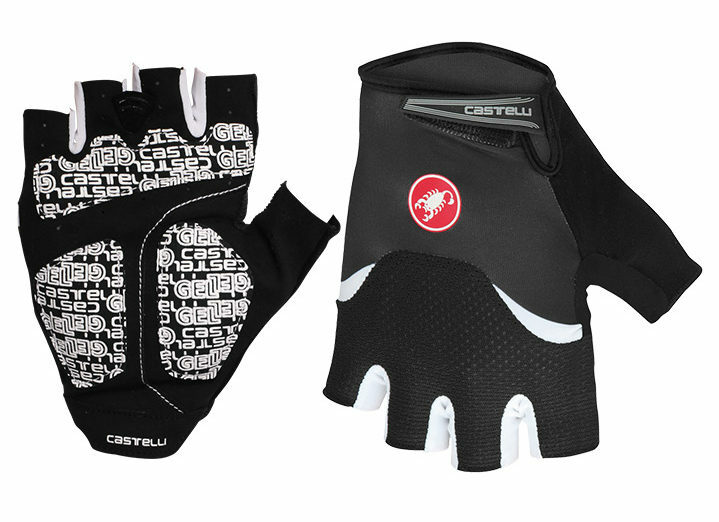 The Scalda Elite is Castelli’s answer to a lightweight, full-finger winter cycling gloves. It’s meant to be worn in temperatures down to around the freezing point. Perhaps even lower if you’ve good cold tolerance. 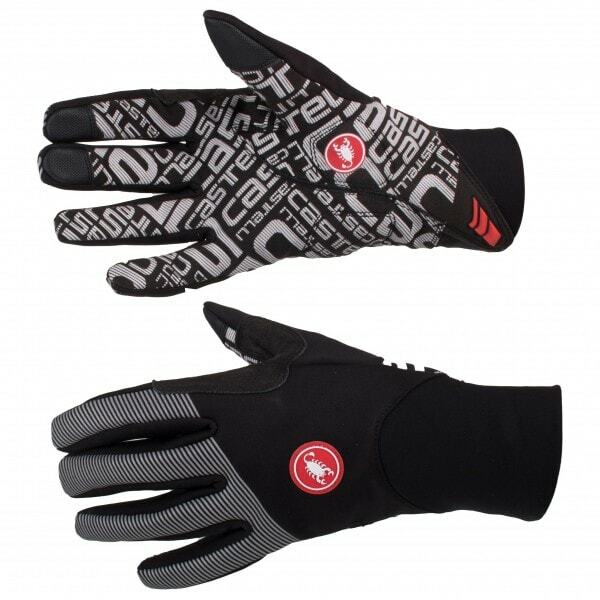 It’s made of stretchable, waterproof and windproof fabrics that will ensure your fingers stay warm while you ride. You’ll also be glad to know that the thumb, index and middle fingers are touchscreen friendly. 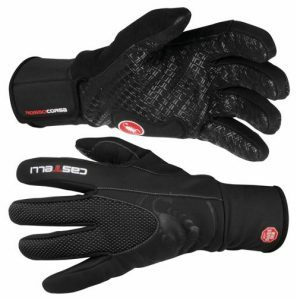 It comes in 3 different colors, black, anthracite and red if you’re looking to match your winter cycling gloves to your kits. Sealskinz is an outdoor clothing brand based in UK. They produce socks, gloves and hats for various sports such as cycling, running, walking and equestrian. 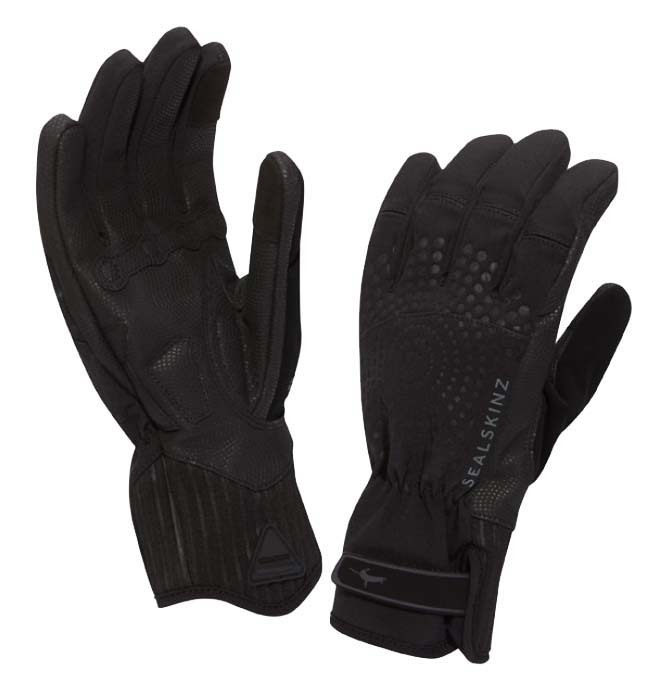 Unlike most winter cycling gloves, this pair of Sealskinz gloves is made of 97% nylon on its outer layers. The inner layers are made of 84% merino wool that provides you with plenty of warmth down to around 35F/2C. The index finger is touchscreen friendly that enables you to access your phones without needing to remove the gloves. Best of all, this pair of gloves is not limited to cycling. You can use it for other outdoor activities during the winter as well. This pair of gloves sits in Pearl Izumi’s flagship PRO series. It’s been updated for fall/winter of 2018 to make it a better fit to the hands. 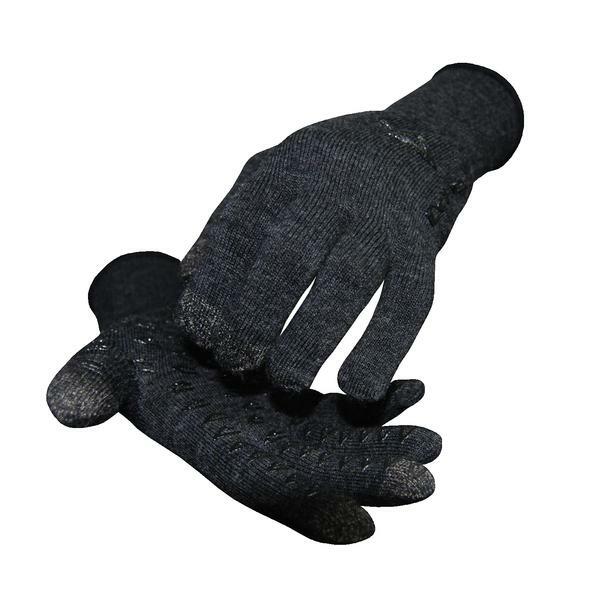 Being a Lite version, it can be worn comfortably down to around 35F/2C before you need to swap them for others such as the PRO AmFib gloves, which has better thermal properties. Using 50 grams of Primaloft’s Gold series for insulation, you can be assured that your fingers will be shielded from the winter chill and kept warm throughout your ride. The outer layers are also water-resistant, having been treated with a DWR (Durable Water Repellent) finish. The inner palms are made of synthetic leather palm with silicone printing to provide you with a firm grip of the handlebars, especially when it’s wet. Remember the snowing, freezing and wet 2013 Milan San Remo edition where Gerald Ciolek won? The Castelli Estremo glove is made for these conditions. 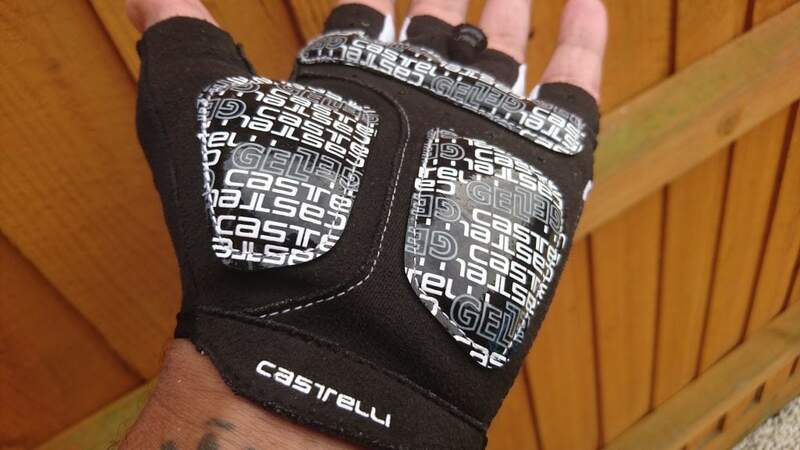 In fact, it’s Castelli’s warmest cycling glove for the winter. You can comfortably wear them down to 20F/-7C. It’s made of a several fabric materials to achieve maximum warmth; fleeced inners, Gore Windstopper fabric and silicone make up most of the outer layers with a micro suede on the thumb panel for the wet nose. When it comes to outdoor winter clothing, Swedish brand, Craft is among the best. In fact, you can see them kitting out most of the athletes in the recent Winter Olympics. The Siberian Wind gloves are designed for cold weather riding with temperatures dropping as low as 25F/-4C. It’s mainly made of polyester with a fleeced inner to provide your hands with extra warmth. The softshell outer layer is both windproof and waterproof, as what a winter cycling glove should be. There are 2 colors options to choose from – black or neon yellow. The Highland is arguably Sealskinz’s warmest cycling gloves for the winter season. You can comfortably wear them to sub-zero temperatures without having the numb fingers sensations. 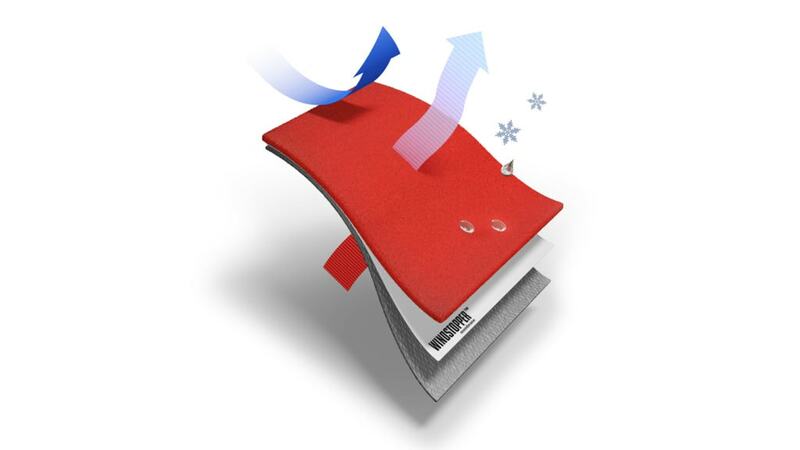 To achieve maximum warmth, Sealskinz uses 3 main materials. The body is made of neoprene, making it 100% waterproof. 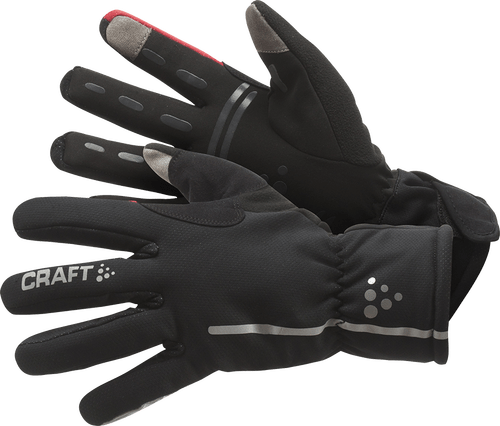 Synthetic suede is used on the palm to provide you with padding and grip on your handlebars, while Climashield (the same one used by the US military) is used for insulation from cold. It’s only available in black color. For starters, Mavic is well-known for wheelsets and not cycling gloves. 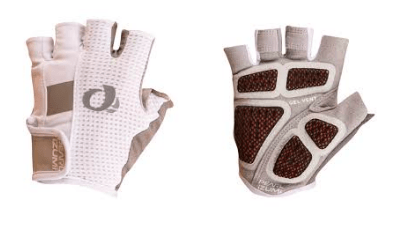 Over the past few years, they’ve quietly entered the cycling clothing market and in the Ksyrium Pro Thermo gloves, they finally have a finished product. It uses Primaloft’s insulation technology which was previously developed for the US military before being commercialized. With this, you can comfortably wear them to sub-zero temperatures during the winter. Unlike other winter cycling gloves, the Ksyrium Pro Thermo actually do feature minimal padding around palm and has a suede finish to provide extra grip of the handlebars especially when it’s wet. 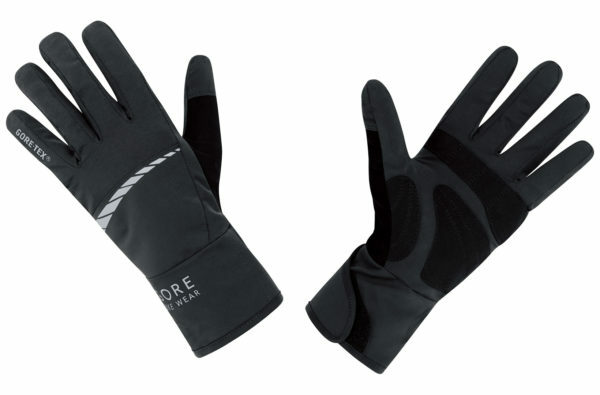 If you’re after an even warmer pair of winter cycling gloves, go for the Thermo+. 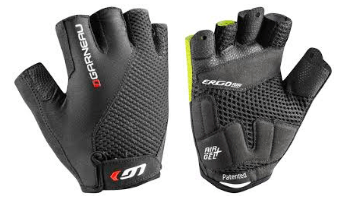 The Proof is Giro’s warmest winter cycling gloves to date. You can wear it in sub-zero temperatures as low as 20F/-7C and still having warm fingers. Extra warmth is achieved through a combination of Polartec’s PowerDry core materials and a fleeced inner layer. It’s fully waterproof yet breathable, thanks to the Outdry membrane developed by the well-known outdoor brand, Columbia. If you want an even warmer pair of gloves, go for the Giro 100 Proof. 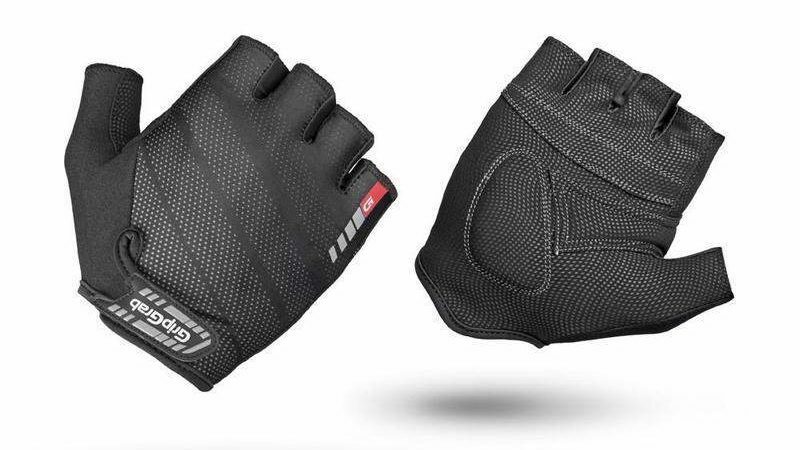 The Zero CS gloves is Giro’s top level, premium gloves for those who are after zero padding. Don’t be fooled by its very minimalistic and lightweight design. 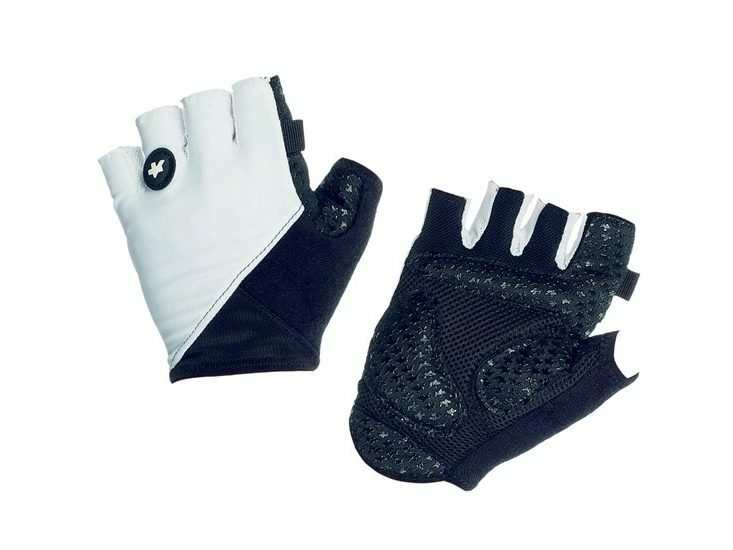 Not only it’s very breathable, grip and control is spot on with the use of 100% sheep leather around the palms. They fit very snugly to give you a very real fee of your handlebars. For those who are fashion conscious, they come in 6 different color which would definitely match your kit of the day. Scottish brand Endura is no stranger to cycling having sponsor the Movistar procycling team for many years now. The FS260 Pro Aerogel gloves are the same gloves used by the procyclists, albeit in different colors. You can expect to have the best materials and features, all tried and tested at the top levels of cycling. The palms are printed with silicone which gives an exceptional grip while the gel padding is minimal yet adequate. Castelli is one of the top cycling clothing brands and has been around for more than a century. The Arenberg gloves are lightweight yet functional. No surprises here coming from a reputable brand. They’re ergonomically designed with suede palms and minimal gel padding at places you need the most protection. Breathability is spot on with the use of mesh fabrics at the back panels. More importantly, you can be sure to get a perfect fit with the adjustable velcro wrist closures. You’re probably familiar with the outdoor brand Gore. But did you know that they’re also into cycling via a brand called Gore Bike Wear. As with all Gore’s products, you can expect a quality pair of gloves. The C5 gloves’ gels are strategically inserted around the palm areas for effective padding. It’s highly breathable using proprietary Gore fabrics at the back panels for those hot days. There are also loops between the fingers for easy removal, a nice touch by Gore. Sportful has been making clothing since the 1940s but it’s only in 1985 that they started making cycling clothing. 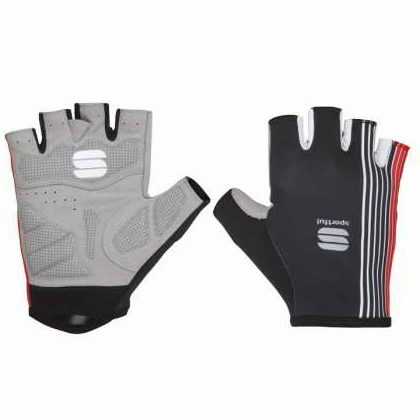 The Sportful BodyFit Pro gloves are the same gloves used by procycling teams sponsored by Sportful. They’re clean, simple yet comfortable. They’ve just the right amount of stretch to provide a snug fit, along with a microfiber section at the bottom of the thumb for wiping off the sweat. Assos has been around for more than 40 years and are well-known for producing high quality cycling clothing. 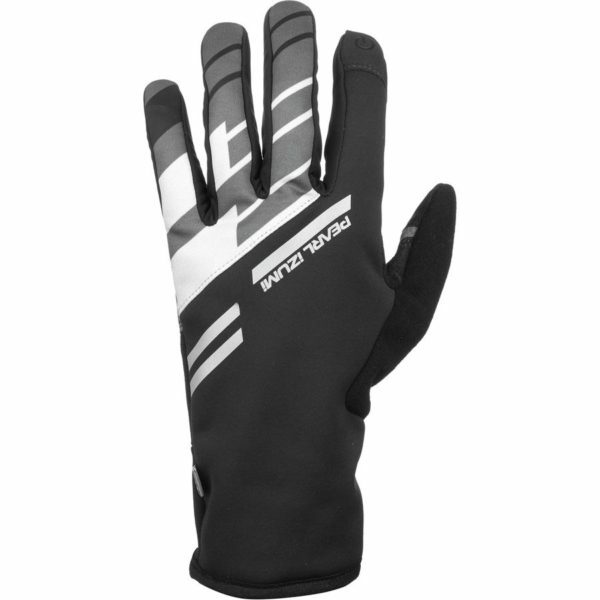 The Assos Summer S7 gloves are an updated version of their popular CYC gloves. The padded inserts are strategically placed to provide comfort while not getting in the way when gripping your handlebars. It’s made of stretchable fabrics along with mesh panels to keep you cool and dry while you ride during the summer. Today Giro they make a wide range of cycling gears and they’re well-known for their helmets and cycling shoes. 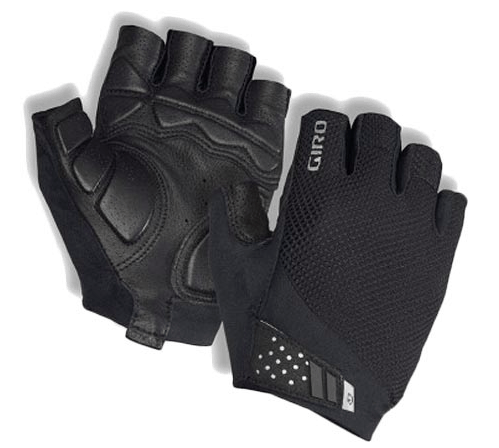 The Giro Monaco 2 is the improved version of the original Giro Monaco gloves. They’re designed for high-mileage riders who are tough on their gloves. The vented leather palm, gel padding and double stitching ensure it holds up for ride after ride. Fit wise, the wrists are adjustable via a velcro strap and they have a breathable, stretchy back panels. The Pro Gel Vent is Pearl Izumi’s mid-range cycling gloves that provides plenty of padding. Please excuse the word Pro in the name. Maximum padding is achieved by a gel insert around the palm area. 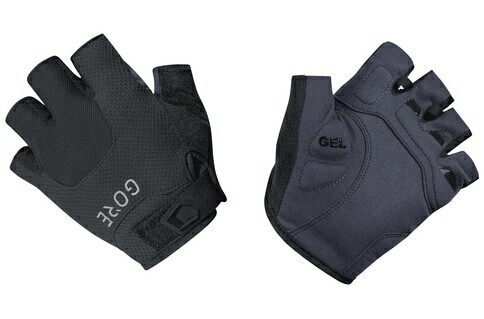 The unique feature about the padding is there are air vents covering the gel inserts, making it more breathable. If you sweat a lot, there’s a sweat wipe below the thumb to wipe them off. The Air Gel+ gloves are great for road cyclists who are seeking out for longer and adventures rides during the summer. Mainly made of spandex, it offers plenty of stretch and ventilation that keeps your fingers cool during the hottest days. There are plenty of padding to be found. Silicone is used as the main material in what Louis Garneau refer to as Progressive Padding. You can expect a snug fit using the adjustable cuff with Velcro closure. GripGrab is a Danish sports brand focusing on cycling and running. The GripGrab Rouleur gloves are made with lightweight, breathable fabrics with a padded palm section. What makes the Rouleur standout is its patented padding called DoctorGel which was developed with the inputs of pro athletes and medical professionals. There are 3 different padding thickness from 2mm to 4mm and 6mm. The GripGrab Rouleur uses a 4mm gel padding which strikes a perfect balance between comfort and control. In general, there are 3 types of bike phone mounts. The type of mount you’ll need depends largely on your phone model and where you want to mount it; the stem or handlebars. This is by far the most important consideration. Proper sizing is critical for ensuring your cycling glove fits appropriately. A gloves that fit too small and tight could lead to chaffing and discomfort. You’ll also find it annoying when the gloves dig in between your fingers. If it’s too big, your fingers will tend to wiggle inside making it difficult for you to grip the handlebars properly and securely. Also, take note that gloves come in all shapes and cuts. Some are narrow and short while some are wide and long. Always check the manufacturer’s sizing guide. Cycling gloves size is determined by measuring the circumference of your hand at the widest point below the knuckles. If required, you should also measure the length of your hand from the tip of the middle finger to your wrist. The longer of these two measurements will determine your size. PRO TIP : The gloves should fit snugly; neither too small nor too big. Padding levels in each pair of gloves vary. On one end of the spectrum is zero padding. On the opposite end is maximum padding while there are some that falls anywhere in between. Paddings are placed around the areas of your palm that are in contact with your bike’s hoods and drops. The padding location of each gloves could differ slightly, but they generally cover about the same areas. There are 3 main types of materials used for padding. The main difference between these is their cost and quality. Foam. The cheapest form of padding and can be found in low to mid-tiered gloves. Doesn’t provide a good feel of the handlebars. EVA. Also known as ethyl vinyl acetate. This is also a material commonly used for cushioning in running shoes. Can be found in mid to high end gloves. Gel. These feel soft and squishy and usually used in mid to high end gloves. Pro. Padding absorbs road vibrations and distribute the pressure when you ride over uneven roads. Con. Too much padding has the same effect as wearing a glove that is too big. It makes it difficult to feel and grip the handlebars well. It’s just the inverse of having padding, really. It all depends on yourself and the type of terrain you’re riding on that day. Personally, I’d prefer zero padding as I want to feel my handlebars. PRO TIP : Gel or EVA padding are the best padding materials. We do check our phones mid-ride, whether it’s to answer a call or checking text messages. And you don’t want to be removing your gloves to do so especially if it’s freezing. So, it’s important to have a pair of glove that is smartphone friendly. In most cases, at least the index finger is touchscreen friendly. The winter weather can be unpredictable and hence, most winter cycling gloves are water-resistant at the minimum. There are exception to this for those made of nylon like the Defeet ET Duragloves. To make them water-resistant, the outer layers are treated with a Durable Water Repellent (DWR) finish. The DWR will ensure the water droplets slide off the fabric surface rather than soaking though it, causing your hands to get wet. You’ll also notice there’s a Gore Windstopper logo printed on some gloves like the Castelli Estremo. The Windstopper is a membrane that is windproof, breathable and water-resistant. For a fully waterproof winter gloves, these are usually made of neoprene. It’s the same material used in scuba diving gloves. But wear this with caution as neoprene is not breathable at all. For some, they could start experiencing clammy palms in as little as 15-30 minutes into the ride. 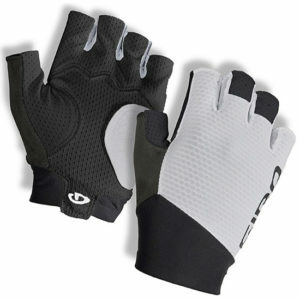 But due to the high demands of cycling gloves manufacturers prefer synthetic insulation. Some refers them as feathers, but they’re not. Down insulation is actually made from a duck or goose’ plumage, which is the lofty and fluffy stuff underneath the feathers. Not something you want in your cycling gloves. Even though synthetic insulation is not as warm as the downs, they excel in other areas. The polyester fibers are resistant to moisture, making it dry faster when it’s wet. More importantly, they’re cheaper when compared to downs. Today, there are many types of synthetic insulation such as Thinsulate, Thermolite, Qualofill and Breathefil. The most popular and widely-used synthetic insulation is developed by Primaloft. It’s a technology first developed in the 1980’s, exclusively for the United States Army. You’d probably notice that the price difference can be at times huge between models. There are $10 gloves and there are those which would cost you nearly $100. Aside from the brand name, the biggest difference lies the materials used. In fact, there are no surprises here. As you move up the price points, you’ll be getting better fabrics, a better grade of padding materials, a more ergonomic fit and a higher construction quality especially the stitching around the fingers where the cheaper ones tend to come off after continuous rubbing against the hoods. PRO TIP : You get what you pay for. 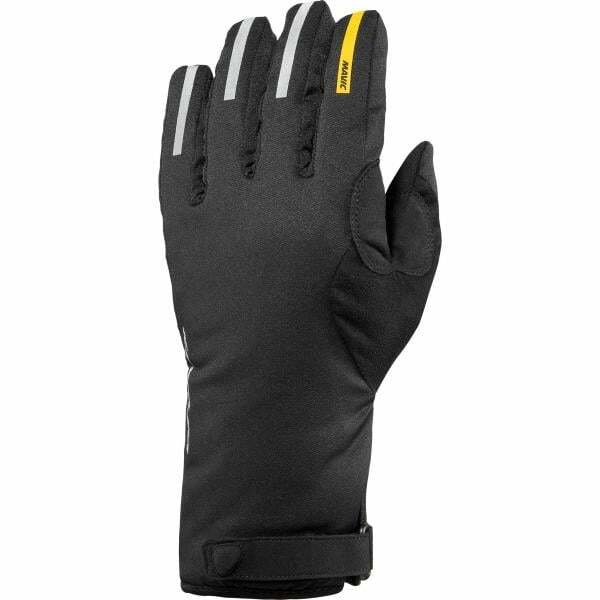 High quality gloves fits ergonomically and are much more comfortable to your hands.